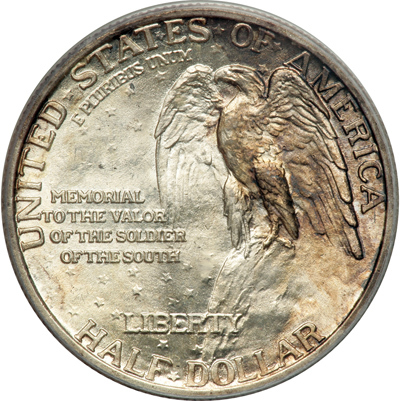 The 1925 Stone Mountain half dollar was struck to help raise funds for the completion of the massive carving honoring Southern Civil War heroes at Stone Mountain, Georgia. The project, which began in 1916, was plagued by numerous interruptions. In fact, it wasn’t until 1970 that the project was actually completed, and that was only after the State of Georgia intervened. 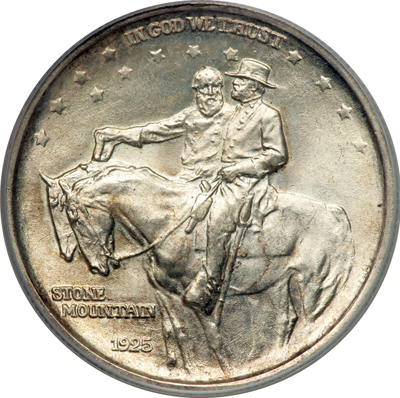 However, by the mid 1920’s, with the hope of finishing the project in a timely manner still alive, the Stone Mountain Confederate Monumental Association decided to raise funds for the project via a commemorative coin. 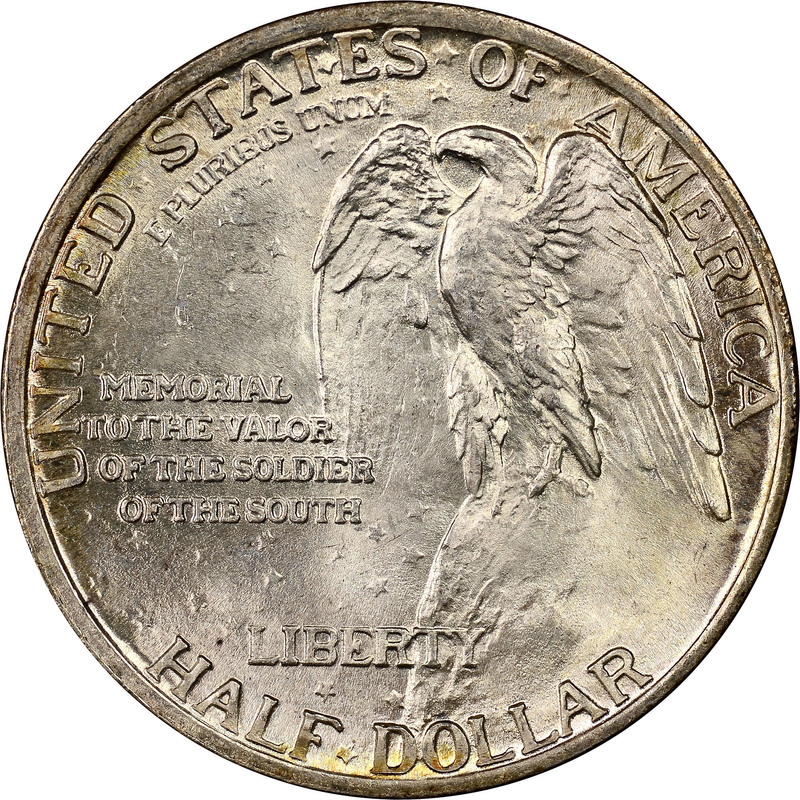 With strong support for the project from President Calvin Coolidge, a bill was easily passed on March 17th, 1924 authorizing the minting of up to 5 million half dollars in commemoration of the soldiers of the South. 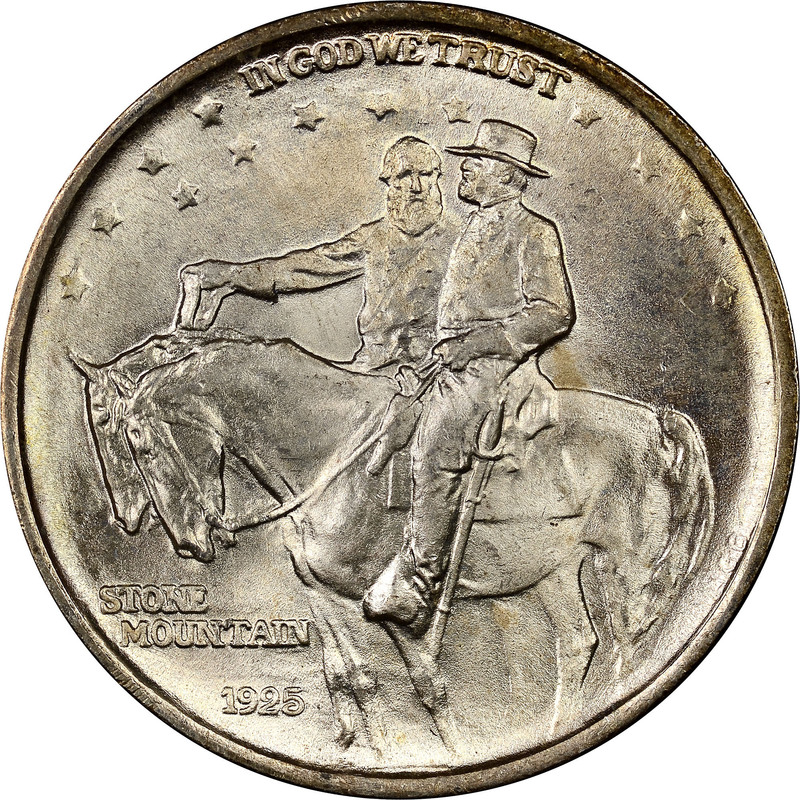 The models for the coin were furnished by Stone Mountain’s original sculptor Gutzon Borglum, who was fired soon after due to many disagreements with the Association. Still, his heavily modified designs were eventually approved on October 10, 1924. 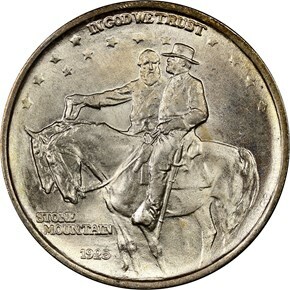 Borglum’s obverse features Confederate war heroes Generals Robert E. Lee and Stonewall Jackson on horseback. Above them is the motto IN GOD WE TRUST. Below to their left is STONE MOUNTAIN and the date, 1925. 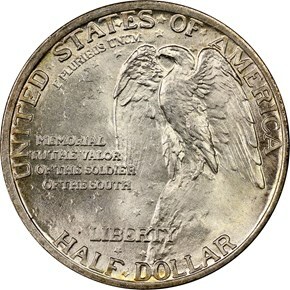 The reverse features a stoic eagle perched on a rock surrounded by a multitude of text. Above the eagle around the periphery are UNITED STATES OF AMERICA and E PLURIBUS UNUM. To its left is the inscription MEMORIAL TO THE VALOR OF THE SOLDIER OF THE SOUTH. LIBERTY and HALF DOLLAR can be found below. The Association was clearly naively optimistic with their maximum mintage of 5 million coins. Less than half of that max mintage was actually coined, to the sum of 2,310,000 pieces. These were offered at $1 each. Some were even counter stamped with the initials of various southern states with a range of serial numbers and then auctioned off to the highest bidder. Even with that special marketing ploy, sales lagged behind. One million coins eventually ended up in the smelter, leaving a net mintage of 1,310,000 pieces. Even this proved too high, however, and many of those were released into circulation at face value.